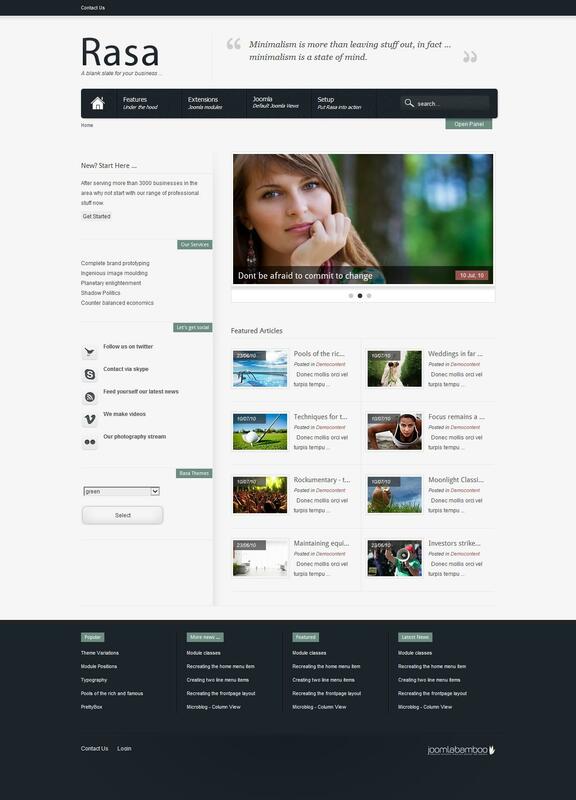 JB Rasa - elegant business template developers JoomlaBamboo, developed on the platform of the brand studio Zen Grid Frameworks. Through the use of a functional framework, this template has a flexible tool to access the settings of the width of the layout elements, additional panels, setting font and color as oformleniyu.V ideological concept of minimalism was chosen designers, allows you to create a quality website does not detract from the main content. The template presented 10 color schemes, over 50 module positions, flexible modular layout and full support for mobile devices. JB Rasa template as a base architecture uses Zen Grid Framework and this means that the module positions are almost always the same for all patterns that use Zen Grid. Having mastered setting a template, you can easily master and all others. In the assembly includes expansion club: JB Library, JB Slodeshow 3 and JB Type.